bl.uk > Online Gallery Home	> Online exhibitions	> King George III Topographical Collection	> View at Landsend, Cornwall. 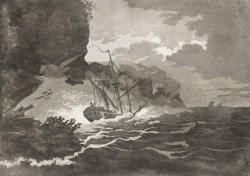 View of a sailing ship in a stormy sea off Land's End. Land's End, as its name suggests is the most westerly point in mainland Britain. Cornwall is a maritime county to the far south west of England.